Pasta filata (Italian: "spun paste") is a technique in the manufacture of a family of Italian cheeses also known in English as stretched-curd, pulled-curd, and plastic-curd cheeses. Stretched curd cheeses manufactured from the pasta filata technique undergo a plasticising and kneading treatment of the fresh curd in hot water, which gives the cheese its fibrous structure. The cheese-making begins in the normal way. The milk (usually from cows or water buffalo) is warmed and curdled and allowed to rest for an hour before the curds are cut into small pieces and the whey is drained off. The curds are allowed to rest for a number of hours. Then follows the filatura. The curds are steeped for some hours in a bath of very hot whey, or water (for Mozzarella di Bufala Campana the temperature is 95 °C). When they begin to float most of the liquid is removed and the curd is mixed and kneaded until the required soft, elastic, stringy texture is obtained. The mass of curd is divided (often by pulling out a thick strand and chopping it) and shaped into individual cheeses. In the case of mozzarella, the process is now essentially complete – ideally these cheeses should be eaten within a matter of a few days. 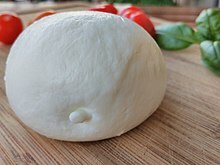 For other formaggi a pasta filata, such as Provolone, Caciocavallo Silano, Pallone di Gravina and Scamorza, further processing is needed: ageing and in some cases brining or smoking. ^ Patrick F. Fox; Paul L. H. McSweeney; Timothy M. Cogan & Timothy P. Guinee (2004). Cheese: Chemistry, Physics and Microbiology: Major Cheese Groups. Elsevier. pp. 251–277. ISBN 9780080500942. Retrieved 8 January 2018. ^ U.S. Patent 7,955,814 citing Kindstedt, Paul S. (1999). "Mozzarella and Pizza cheese". Cheese: Chemistry, Physics & Microbiology (second ed.). Elsevier Science & Technology. 2: Major Cheese groups: 337–341. ISBN 0834213389. OCLC 634036414. ^ "Provolone Piccante". www.cheesemonthclub.com. Retrieved 2018-10-24. This page was last edited on 12 March 2019, at 19:13 (UTC).